Something about the month of December invokes images of quaint towns decorated for the holidays, like you might see in Norman Rockwell paintings. The theme for this week’s Sunday Stills challenge is “In Your Town.” What is special about your hometown or the town in which you currently reside? Last week, on the way to attending a Lindsey Stirling concert in downtown Sacramento, I finally took a photo of California’s State Capitol. You would think that after living here for 30 years, I would have a photo or two by now. This night shot was 2 weeks shy of the official Christmas tree lighting ceremony. You can just make out the crane and unadorned, dark tree in the shadows. 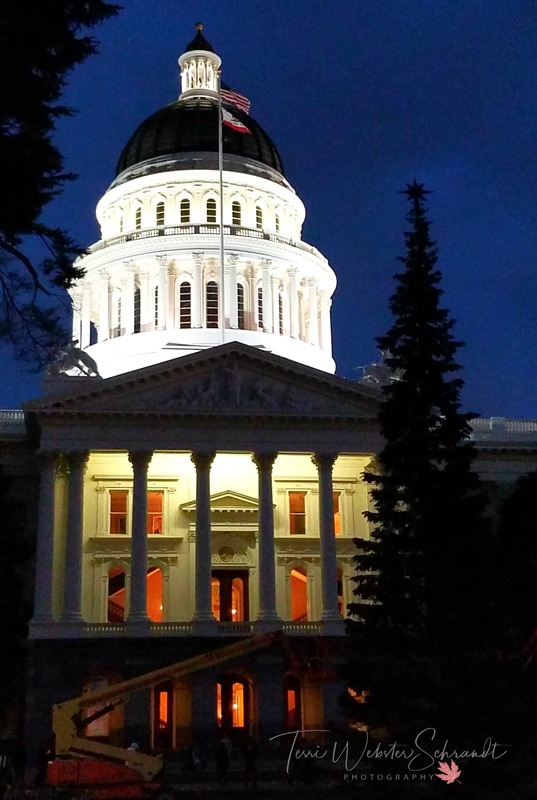 Near Old Sacramento, a popular tourist destination home to the Gold Rush Era of 1849 (an outgrowth of Sutter’s Fort), the capitol is within walking distance (about 10 blocks) and is a popular must-see when visiting the Sacramento area. 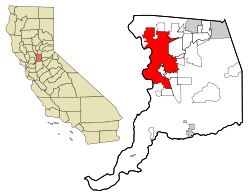 Sacramento is centrally located to other world-wide tourist destinations: San Francisco Bay area, 90 miles west, and Lake Tahoe, about 90 miles east of Sacramento. Because of Sacramento’s location, many visitors stop by the Capitol on their way to or from these destinations. In Sacramento, what I think stands out from most other cities, is the sheer number of trees found in the region. At this writing, Autumn hit its peak colors late, but oh what a show! I braved rain and blustery conditions the day before Thanksgiving to capture the Ginkgoes before the storms blew the leaves off the trees. This image is linked to two photo challenges, Sunday Trees and Festival of Leaves. Back to the idea of quaint towns, not far from Sacramento resided local Northern California artist, Thomas Kinkade, whose magical paintings invoke fairy-tale towns and images. 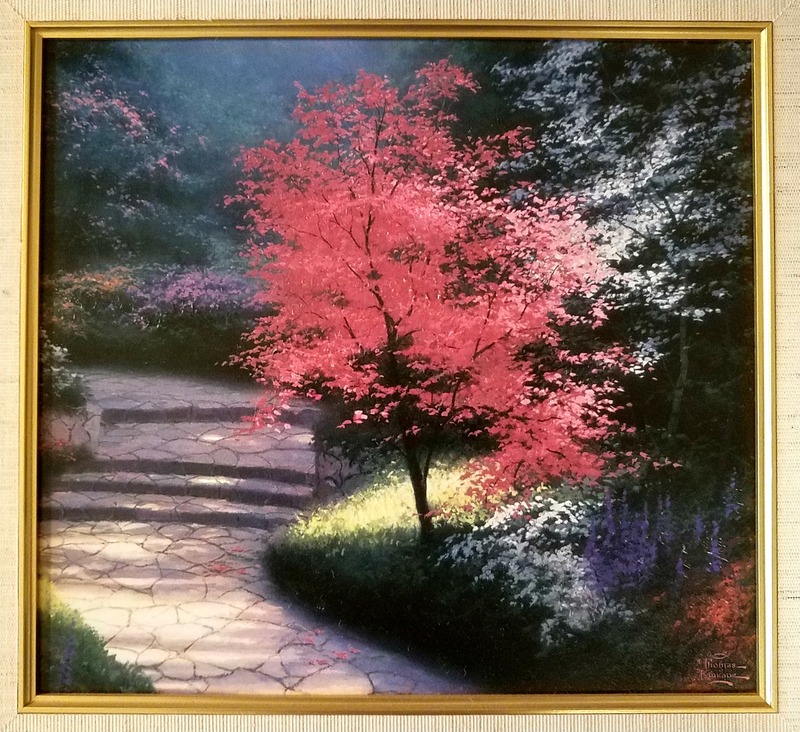 His home gallery is located in Placerville, California and features his best works. Born in Sacramento in 1958, Kinkade passed away in 2012. Years ago, my mother bought two of his prints for me which happily hang on my living room wall. Time for Autumn! 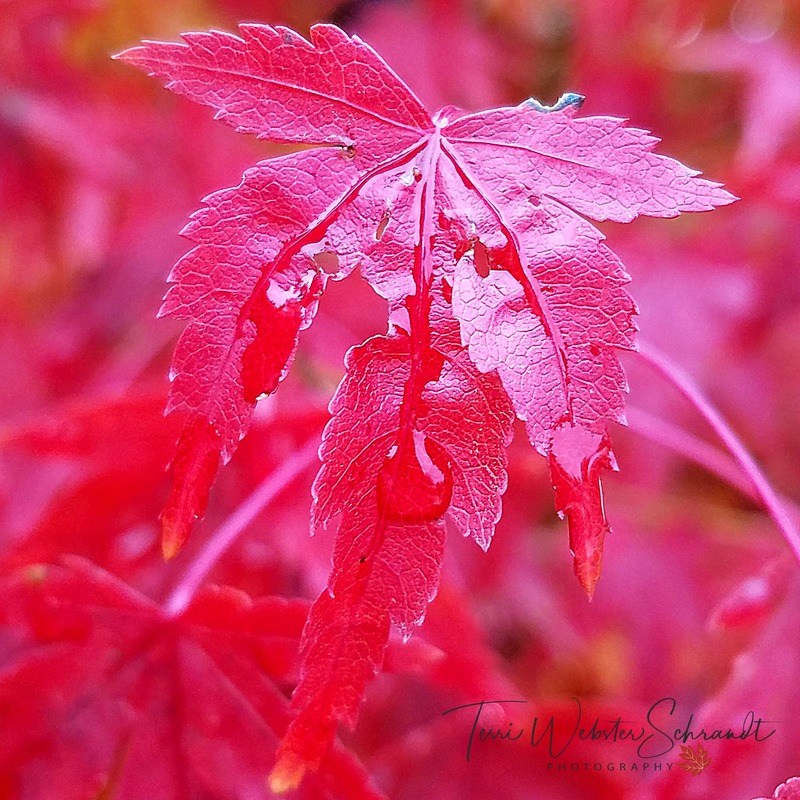 I have a Japanese Maple tree in my own front yard, because not only do I love trees, but I also like the idea of contributing to the local tree canopy. This one is linked to Becky B’s #timesquare December photo challenge. This is also linked to Cee’s Flower of the Day. Other sights to see in and around the Sacramento area are featured in this gallery. If you were a tourist visiting your own home town for the first time, what would you want to see? What special feature of your town would tourists ruin if discovered? Please visit our new Sunday Stills November participant Little Borneo Girl. I’m in the throes of the final days of school which means lots o’ papers to grade! That’s why I managed to link to four photo challenges this week in one post! Hope you can join in the fun! I have discontinued the link-up. Thank you to all of those who participated faithfully in the link-up! Please link to this post or my Sunday Stills page so I can find your post and share it! I really enjoyed these beautiful tree photos. Not exactly what I have connected Sacramento with previously. Thank you! 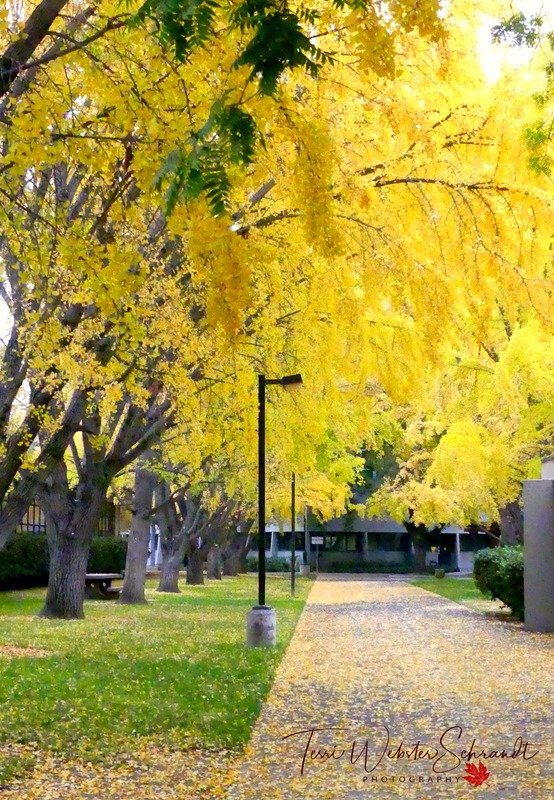 While I have enjoyed many a fall foliage image in your previous posts, I never knew of Sacramento’s being a major autumnal spot (largest tree canopy in the US and CSUS being designated as Tree Campus USA – who knew?). Your latest images make me long for autumn in a lifestyle that has created an endless summer. Thank you for returning me to my favorite season. My town is a moving target at the moment as we will have a shifting residence over the coming few weeks as we make our way to Cape Town. Aww, always nice to hear from you, Lisa! I can see how perpetual summer could be both attractive and a little boring if you long for seasons, but I could live with it for a while! Beautiful images Terri- always nice to see where someone lives! Thanks, Deb! It puts on a beautiful show every year! Sacramento should put you on the city payroll. I live in California also but you gave me quite an education about our state capitol. (I’m a bit limited on Cal. history. Should correct that.) The photos are, as usual, spectacular. I was in Portland, OR a few weeks ago and had a wonderful time enjoying its autumn show of colors. Miss it down here in So Cal. Funny you say that, Shari, I was on the city payroll for 32 years! I lived in Beaverton, OR for 2 yrs as a child, loved it there! I love our seasons, and maybe better without snow! If I was a tourist visiting my section of Vancouver Island, I would want to visit Cathedral Grove (a rare and endangered remnant of an ancient Douglas fir ecosystem). When you come to visit us, I will take you there. Thank you for your work on Sunday Stills. I greatly enjoying viewing your photos! That sounds right up my alley, Donna! SS challenges me, too! Fun post Shelley! Thanks for connecting with Sunday Stills! I remember visiting the Capitol Building in Sacramento when we visited in the early 2000s, Terri. I also remembered how clean and well-kept everything was in the city. We were there in early October and it was quiet, so we were able to drive around the city without any holdups. I think we only had a day there while on our way to Lake Tahoe for three days. You’ve captured your home city very well. The photography is, as ever, amazing. Thanks so much, Hugh! I am glad you took a tour of our city! It’s a great place to live! I love the Capitol Building, Terri – it looks magnificent. And the trees are glorious. Those brilliant yellow leaves on the ginkgoes are stunning. Nice shot! Before we moved away from Colorado Springs, CO, we spent time acting like tourists. We never made it to the top of Pikes Peak, but at least we finally managed to take in some tourists sights before moving away. Debating a fun idea Terri! My mom loved Kincaid too 😊 and I love trees, so there you go! I would love to see more of your home town or a town you would like to feature! Thanks, Debbie! I’m looking forward to your tour! The photo of the Green Sierra foothills in your gallery is breathtaking, Terri! Looks like a place I want to visit. Lovely to get a “tour” around your town. Hope your Thanksgiving was lovely! Hi Britta, nice to hear from you! It gets really green when we get lots of rain! Thank you for taking the tour with me! How cool Becky! That might have been Gov. Deukmajian back then. I never get tired of seeing the ginkoes. Thanks, Na’Ama! Very nice photos Terri. How nice to have all those trees. And funny that you haven’t before taken photos of the Capitol Building. Perhaps it’s one of those things that is so familiar that it seems ordinary and not worth a photo! There you go. I think challenges help everyone think about things that might be outside their normal experience. Gorgeous pictures as always, Terri. I enjoyed learning about Sacramento, Terri. Your photos are outstanding as usual – crazy about the tree canopy. And usually yellow is my least favorite fall color for trees, but that’s because they turn a dull yellow in Maine – these trees are exquisite! We planted a small Japanese maple in our patio garden and I love it! Patrick built a house for it to protect it from the weather. It is only a couple of years old so vulnerable to the elements. It is fun to look at one’s hometown through the eyes of a newcomer and you have done just that with yours! Thanks so much, Molly, Sacramento has it’s charm. My original hometown was San Diego, and while beautiful, it doesn’t have the tree canopy or much in the way of seasons. I’ve never seen anything like the ginkgoes, I never tire of seeing them! I’ve been to San Diego but have not been to Sacramento. My husband works for Jackson Lab in Bar Harbor, Maine, and they have a facility in Sacramento. Some of his coworkers are there now. I just told him if he ever has to go out there, I’m tagging along so I can meet my friend, Terri! Wouldn’t that be wonderful?? I hope that can happen, Molly! Me, too! I’m going to be on the alert for any future plans. Amazing shots. 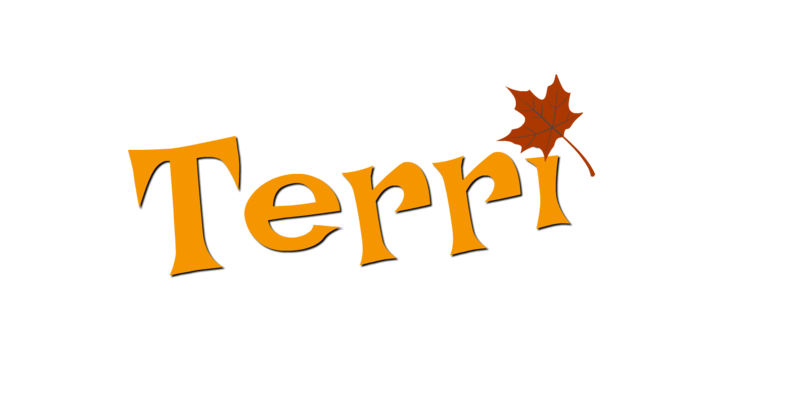 Terri. Another thing I like about Sacramento is the feeling of space when you walk around the city. Old Town can be a bit busy, but I always felt I could breathe whenever we explored the city. I have an attraction to Capitols, so I try to always stop when we pass through state capitals, to check out the Capitol building. Mark and I explored Sacramento and the surrounding areas in depth, when we house sat for three months in Rocklin, two years ago. The Gold Rush era and remnants are fascinating. Was that really two years ago already? I was amazed to see the Gold Rush era architecture in the gold country towns when I first came here. I bet you’ve seen a few capitols, Liesbet! Such an interesting photo essay about your home town. Thank you. Best wishes with your grading of papers.